"Looking for the ultimate and unique gift? How about a Chocolate Dipped Bottle of Wine? 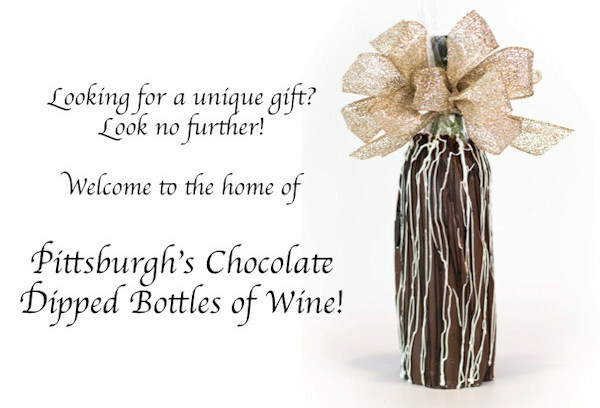 Our hand-dipped and decorated bottles of wine bring together two favorites - Wine & Chocolate! The outer layer of chocolate simply falls off the bottle when opened, for an instant treat to enjoy with your favorite wine. Bring in your favorite bottle of wine to My Favorite Sweet Shoppe. We hand-dip and embellish your bottle of wine and have it ready for pick-up in three short days! *Does NOT include the cost of the wine. My Favorite Sweet Shoppe does not purchase/sell any alcohol. Bottles must be brought in when the order is placed. *Some designs may vary. Does not include any customization. Triple Chocolate Bottle: A classic favorite - Hand-dipped in milk chocolate and topped with white and dark chocolate makes our Triple Chocolate Bottle the perfect gift! Mini Happy Couple Bottles: Great things can come in small packages, too! Our mini Bride & Groom bottles are sold individually. But it doesn't stop there, ANY of our designs can be made into small bottles upon request for $9.95. The Happy Couple: Our Bride & Groom Bottles are sold individually, and perfect for the newly engaged, or married couple! 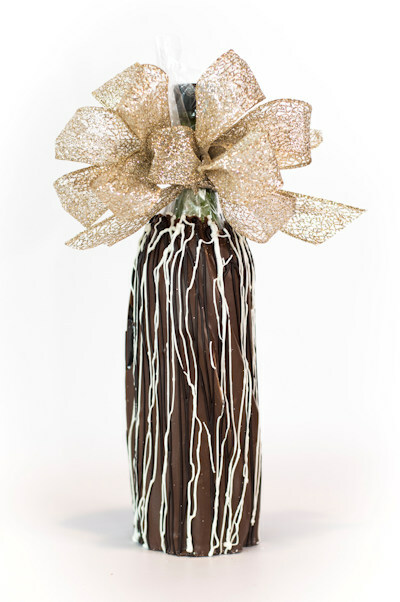 Love is in the Air Bottle: Love will be in the air this Valentine's Day with this hand-dipped and decorated bottle! *Can be dipped in Milk, White or Dark Chocolate. Bow color and heart/"love" can be customized. **Does not include strawberries - please see Valentine's Day Special product for details. Valentine's Day Swirls: Hand-dipped and carefully decorated with red swirls with crystal sugars, this elegant bottle exudes romance! *Can be dipped in Milk, White or Dark Chocolate. Bow color and swirl color can be customized. Valentine's Day : Hand-dipped and hand-decorated with red and pink chocolates, topped with delicate non-pariels, this could be the perfect dessert this Valentine's Day! *Can be dipped in Milk, White or Dark Chocolate. Bow color can be customized. Jimmies Everywhere Bottle: Jimmies Everywhere Bottle, is hand-dipped and topped with your favorite sprinkles! Pop a bottle of bubbly to celebrate! Our Welcome Home bottle is ideal for new homeowners! Hand-dipped and hand-decorated, this bottle is a fun way to say congrats! Plus, after all that moving - couldn't we all use a drink? Glitter Bottle: Elegant and classic, our Glitter Bottle, is hand-dipped and decorated in either Silver or Gold Kingz Crystal sugars. Celebration Bottle: Our Celebration Bottle is perfect for any event! Birthday, promotion, college graduation, anniversary - everything! Hand-dipped and decorated with large swirls makes this bottle fun for everyone! Welcome New Baby Bottle: Congrats are in order for a new baby! Our Welcome New Baby Bottle, is a nice way to let the new parents celebrate! Maybe even offer up a FREE night of babysitting, too?! You'll definitely be the favorite friend! *Can be dipped in Milk, White or Dark Chocolate. Bow color, footprint and date can be customized. Happy Birthday Bottle: Our Happy Birthday Bottle is hand-dipped in chocolate and covered in rainbow nonpariels! The addition of the number is optional, and is included in the design! "It's A BOY" with a bottle of champagne, or sparkling grape juice! "Will you be my Bridesmaid" for the best friends a girl has! "Will you Marry Me?!" for the special person in your life! Whatever the message, this is the perfect bottle to share it! *Can be dipped in Milk, White or Dark Chocolate. Message and design can be customized per occasion.